The first Robert Service poem I remember reading is, arguably, his best known: The Cremation of Sam McGee. I can’t remember exactly how old I was. Young enough that I remember it was actually being read to me. I also can’t say exactly how old I was when I realised The Cremation of Sam McGee was not intended as a children’s story. In hindsight, cremation does seem an unlikely topic for a children’s book. On the other hand, I don’t recall being freaked out in the least. Goes to show, you can broach pretty much any topic with kids if you do it right. How might one confuse the story of a Klondike prospector cremating his Tennessee-born, recently frozen to death friend with children’s literature? My clearest mental image is of Sam McGee smiling from the flames of the boiler in which he was cremated (with unanticipated results). Kudos to the illustrator, Ted Harrison; it didn’t look nearly as creepy as it sounds. 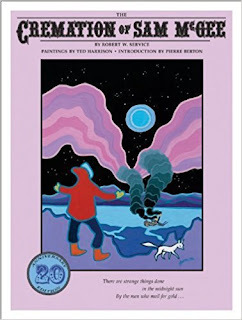 And kudos to Kids Can Press for realising even a poem about death and cremation in the Klondike could be presented in a kid-friendly fashion. Anyone else remember that Klondike Bar commercial from the 80s? It’s now stuck in my head. I will leave you with the question: What would you do for a Klondike Bar? Robert Service was my dad’s favorite poet, and I still have his copy of his poetry, thanks for making me smile in memory of him today.